Over the past 7 years, DJ DA crafted his love for music into a flourishing career as an urban club/radio/mixtape DJ in South Florida. Born and raised in Miami, he now resides in Fort Pierce, FL, where he does a nightly radio show. What DJ crews are you affiliated with? I’m a Slip-N-Slide DJ and I’m also a Cool Runnings DJ with Bigga Rankin. How did you become a DJ? 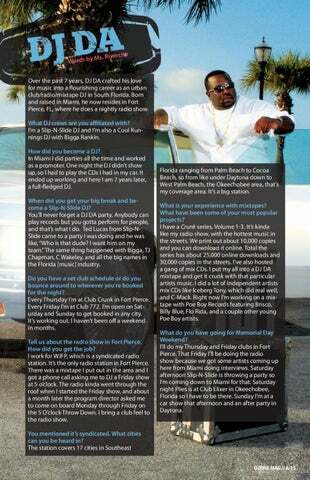 In Miami I did parties all the time and worked as a promoter. One night the DJ didn’t show up, so I had to play the CDs I had in my car. It ended up working and here I am 7 years later, a full-fledged DJ. When did you get your big break and become a Slip-N-Slide DJ? You’ll never forget a DJ DA party. Anybody can play records but you gotta perform for people, and that’s what I do. Ted Lucas from Slip-NSlide came to a party I was doing and he was like, “Who is that dude? 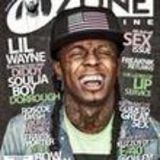 I want him on my team.” The same thing happened with Bigga, TJ Chapman, C Wakeley, and all the big names in the Florida [music] industry. Do you have a set club schedule or do you bounce around to wherever you’re booked for the night? Every Thursday I’m at Club Crunk in Fort Pierce. Every Friday I’m at Club 772. I’m open on Saturday and Sunday to get booked in any city. It’s working out. I haven’t been off a weekend in months. Tell us about the radio show in Fort Pierce. How did you get the job? I work for WJFP, which is a syndicated radio station. It’s the only radio station in Fort Pierce. There was a mixtape I put out in the area and I got a phone call asking me to DJ a Friday show at 5 o’clock. The radio kinda went through the roof when I started the Friday show, and about a month later the program director asked me to come on board Monday through Friday on the 5 O’clock Throw Down. I bring a club feel to the radio show. Florida ranging from Palm Beach to Cocoa Beach, so from like under Daytona down to West Palm Beach, the Okeechobee area, that’s my coverage area. It’s a big station. What is your experience with mixtapes? What have been some of your most popular projects? I have a Crunk series, Volume 1-3. It’s kinda like my radio show, with the hottest music in the streets. We print out about 10,000 copies and you can download it online. Total the series has about 25,000 online downloads and 30,000 copies in the streets. I’ve also hosted a gang of mix CDs. I put my all into a DJ DA mixtape and get it crunk with that particular artists music. I did a lot of independent artists mix CDs like Iceberg Tony, which did real well, and C-Mack. Right now I’m working on a mixtape with Poe Boy Records featuring Brisco, Billy Blue, Flo Rida, and a couple other young Poe Boy artists. What do you have going for Memorial Day Weekend? I’ll do my Thursday and Friday clubs in Fort Pierce. That Friday I’ll be doing the radio show because we got some artists coming up here from Miami doing interviews. Saturday afternoon Slip-N-Slide is throwing a party so I’m coming down to Miami for that. Saturday night Plies is at Club Elixer in Okeechobee, Florida so I have to be there. Sunday I’m at a car show that afternoon and an after party in Daytona.